There are many advantages to living in Donhead St Mary and surrounding area, including free delivery on all purchases from our online shop within a 10 mile radius of our orchard. But if you live further afield don’t worry, we’ll whisk your order to you by courier. Please note, our ciders contain sulphites. You must be at least 18 years of age to place an order. By placing an order online you are confirming you are at least 18 years old. Where we cannot verify your age you may be asked for proof. Failure to provide evidence will result in the cancellation of the order. 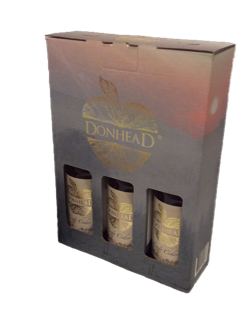 The Donhead Apple Company reserves the right to reject orders in the event that the item is no longer available. Delivery can be expected within 7 working days of placing an online order though on most occasions this will take 3 working days. Delivery will be made to the UK mainland only. The signature of an over 18 year old will be required by the courier. Free local delivery is only available to addresses within 10 miles of Donhead St Mary. A full refund or replacement will be provided for any items damaged or spoiled in transit or deemed faulty upon arrival. Please note that evidence may be required before a refund is made. If it is necessary to return an item, the will be done at the cost of The Donhead Apple Company Ltd.
Orders may be cancelled up to 14 days after delivery. A full refund will be made as soon as the goods are returned in good condition. Please note that the cost of returning goods will be borne by buyer unless they are returned for reason of damage or fault. In the event of a cause for complaint please email squeezme@donheadapple.com. Your complaint will be acknowledged within 48 hours and we aim to resolve it within 7 days. The prices quoted are inclusive of VAT at the currently applicable rate. You must be over 18 years old to buy from this shop.